All good things must come to an end, even a flavorful 50-cent Mt. Olive pickle at the N.C. State Fair. After more than 60 years, Mt. 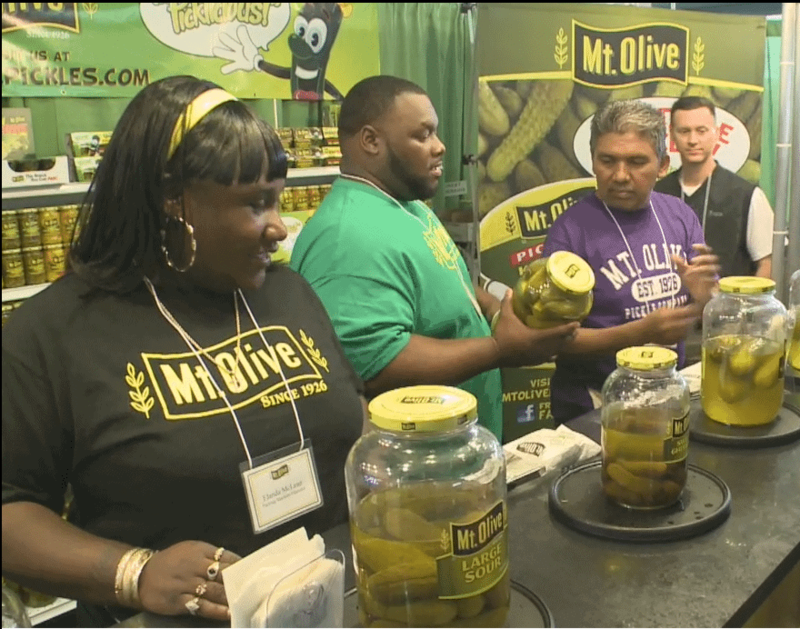 Olive Pickle is discontinuing its participation at the North Carolina State Fair in Raleigh. The company will not operate its booth this year. “This decision comes with great regret, as our presence at the State Fair has been a tradition for our employees and for fairgoers for a long, long time,” said Lynn Williams, public relations manager for the company. Mt. Olive did not operate its booth in 2016 because of the timing of Hurricane Matthew – it roared through Eastern North Carolina just days before move-in at the State Fair in early October. While the company made it through the storm relatively unscathed, the broader region suffered historic flooding, damaged roads and loss of power. The company opted to focus on getting its operations back up and running in the days that followed. This year’s decision also centers on the operational needs of the company. When the company started its State Fair run back in the 1950s and for years after, its “green season” – when fresh cucumber intake is at its peak – was focused on just the North Carolina cucumber crop. Green season at that time lasted six weeks, beginning in late May and closing out in early July. “By October things were quieter and we could turn our attention to the State Fair,” Ms. Williams said. The company’s growth in more recent years has meant it procures fresh cucumbers from other parts of the country, extending green season well into October. Green season, now six months in length, generally requires longer shifts and production on many Saturdays. For years, fair goers visited the booth to buy a pickle for 50 cents – their choice of Dill, Kosher Dill, Sweet, Sour or Hot n Spicy. They could also pick up a few scratch n sniff pickle stickers and try their hand at the guessing game to determine how many pickles were in the 2.5 gallon jar. The closest guesser each day received a gift pack assortment of pickles from the company after the fair was over. “The biggest appeal for the booth was always the interaction between our employees and fair goers,” Ms. Williams said. “Our employees loved the opportunity to engage with the people who enjoyed our products. And fair goers enjoyed talking with the folks who actually made their favorite pickles. Mt. Olive Pickle was founded in 1926 by a group of local business people as a way to address bumper crops of cucumbers that were going to waste in the fields, lacking demand. Business leaders reasoned a new market for farmers would benefit the whole town. Today the privately-held company manufactures the best-selling brand of pickles, peppers and relishes in the US, producing over 160 million jars annually at its facilities in Mount Olive. It employs 600 year-round and another 350 temporary workers during its green season. Sad to hear about this. It was one of my favorite booths to go to. That’s a shame. Attending a community fair is like telling a community thanks and we are proud to be a part of the community. Really going to miss this icon of the NC State Fair! Love the pickles and would almost consider volunteering for the booth. Or better yet “will work for pickles” is not a bad incentive!! I’m so sad!!! My whole family will miss you guys. I used to visit with my grandfather and now my daughter. Only pickle I buy!! Sorry to hear this. Always enjoyed visiting the booth. I know exactly where it was every year. I don’t feel this is a real reason to me. I am a country girl and this sounds like a lot of hog wash. You don’t have to pull employees of the job to go to man your fair booth. Do you realize how many volunteers you could get to do that it you ask. Mt. Olive pickles are famous at the fair and many people look forward to getting them. Don’t mess up now.. Ask and you shall receive. First you stopped producing my Super Sweet Dill Strips. Not enough sales I guess. Now, you’re leaving the fair. It’s business. Pure. Simple. Business. It makes me sad when business overtakes tradition. You will be missed. Love your sweet pickles and relishes. Oh, no! Y’all have been there throughout my children”s lives! Missed y’all last year and will forever! Big mistake guys….some things you just do despite the challenges. It list Dill Pickles and Kosher Dill Pickles. What is the difference between Dill Pickles and Kosher Dill Pickles? Are they the same pickle in taste and manufacturing process? Dill and Kosher Dill are different on two fronts: our Dills are processed, meaning they have been fermented in one of our 1,100 brine tanks first. They are also flavored with just Dill flavoring. Our Kosher Dills are fresh pack, which means they do not undergo a fermentation process, and they contain both garlic and dill flavorings. This makes me sad. This was always my favorite place to visit at the fair. I was sorry to read about your decision to not have a booth at this year’s State Fair but I certainly do understand. Mt. Olive Pickles are the best anywhere around. My friends up here in Virginia always want pickles from the plant and no other brand can compare. Please keep the delicious pickles coming in the grocery stores. Thanks for the memories! Always the best to Mt Olive Pickle company and its staff. Very sad! One of my kids favorite booths! Best of luck to you guys! You will be very missed by the Talton family! That’s weak. 600 year-round employees and you can’t spare a handful to represent one of the most successful results of NC Agriculture at the state fair? The way I read this, your business is so good you just don’t need the home folks anymore. That’s fine. Walmart pickles are cheaper anyway. It sounds like you are trading tradition for profits. So sad Just another wonderful old nostalgic memory gone the way of big business. You will be missed and it’s sad you don’t care more. I am so sad!! I was already planning to get my Dill pickle! I have such great memories of getting my pickle every year at the fair. i agree with all the other negative posts here. It is stupid and short sighted. Do you realize the advertising and good will you get from that? Each year new people learn you are a North Carolina company and opt to purchase your brand instead of someone else’s. In addition, people get to try pickles they might not be willing to purchase an entire jar of. You are just another company that is a victim of corporate greed. Sad.